I started testing R2 six days ago. During this time I've worked on a large project for ~140k words and several smaller ones, including one corpus creation with manual alignment and two or three template projects. The only problem I had with ribbon was some strange design decisions with LiveDocs ribbon and a single non-working keyboard shortcut, which should already be fixed. And while I was skeptical with regard to ribbon, it's really much more useful than standard menus. Even the grouping most of the time makes great sense. Thank you, Marek - I had intended to ask your opinion privately, and I think that in the end we'll all converge on the opinion that the ribbon design really is more useful than the old menus. But as trainers we'll still face the challenge for a while that many new users will still have to learn the old interface to work on server-based projects for clients who have not upgraded. That will be an interesting balancing act and one, I think, where the focus on processes rather than specific features will be most important. FWIW I went through a similar process when DVX3 appeared with the ribbon. I raged against it at first, but now I quite happily work with it. Perhaps this experience is somehow correlated with our age and the number of years we have been working with our tools? Ribbon vs. no ribbon - I think it really depends how the ribbon is implemented, and how the menus that it replaces were implemented. For me the memoQ ribbon is probably going to be an improvement: I haven't used memoQ so often in the past as to have formed really ingrained habits. 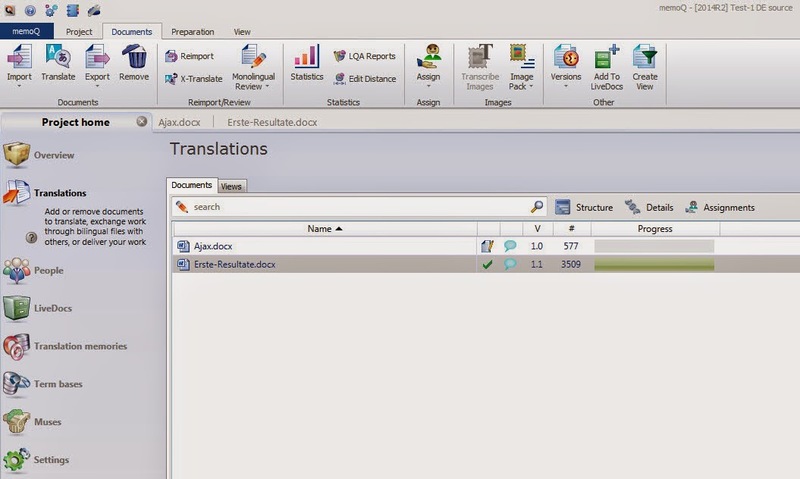 Also, the memoQ menus did not include (as far as I know) customizable toolbars that could be displayed or not based on the translator's way of working. On the other hand, Studio 2011 did offer such toolbars, so the move to a non-customizable ribbon was, for me, a big step backward. Even so, I hear from many translators who don't use Studio as often as I do that they find the ribbon easier to work with. An important thing is how much the ribbon is customizable: MS Office offers a very customizable Quick Access toolbar - I've taken full advantage of that to put there the commands that I know I use frequently and that otherwise would be buried in some illogical place on the MS Word ribbon (for the rest, I use the very handy UBit menu replacement). On the other hand, Studio has a non-customizable Quick Access toolbar (it is "customizable", according to SDL - in that you can choose whether to display it above or below the ribbon, but you cannot change the commands that appear on it), and that for me is a big problem (the commands SDL in its infinite wisdom chose to add to the Quick Access toolbar are not among those I would use often). I haven't installed memoQ 2014 R2, yet, so I don't know how they dealt with the QuickAccess toolbar. I hope they made it customizable. It's not customizable in this iteration, Riccardo, but I think a dedicated ribbon on which one could build one's own workflow-oriented custom command selection would be a damned fine thing. Especially if multiple profiles for this could be created. But I would not make everything customizable, because that would create a support nightmare that I don't think you need me to describe. I was, however, griping at one of the designers today about some default choices for button behaviors (particularly for import) which do not reflect my routine needs not those of some other users I know, and I hope that in the future memoQ will have more capacity to remember user setting preferences or the last or recent choices made. This would save me a lot of time. One thing I found should make many individuals very happy. I looked at the last page of the version briefing document, which I think you also have, and started to use a yellow marker on the items in the long bullet list which were not rather important for individual translators as opposed to those clearly aimed at managing servers and large, multi-person projects. All but 6 items were clearly beneficial to individuals or small partner teams, and one of the most interesting to me was of no use to the corporate crowd whatsoever but gives me the functionality that was offered very reasonably to me a few years ago for several thousand euros - for free and with far less hassle. This whole ribbon thing, on the whole, is more beneficial to your average freelancer than server-using PMs and their hierarchy. It doesn't harm the latter, and they will clearly benefit as well, but they have more support resources usually to deal with complexity. So relatively speaking, the help for the small guys is greater.